Even though Watch Dogs hasn't been out for very long, many folks have taken to Steam to give everyone their two cents on the game. Many reviews are, admittedly, rather negative—that's not too surprising, given the connectivity issues that Watch Dogs has experienced during launch. There's also the feeling that some people are disappointed after all the hype, which means that while there are some classic absurd Steam reviews, most of the top reviews aren't so hot on the game. 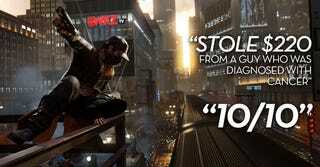 You can check out more Watch Dogs Steam reviews here.